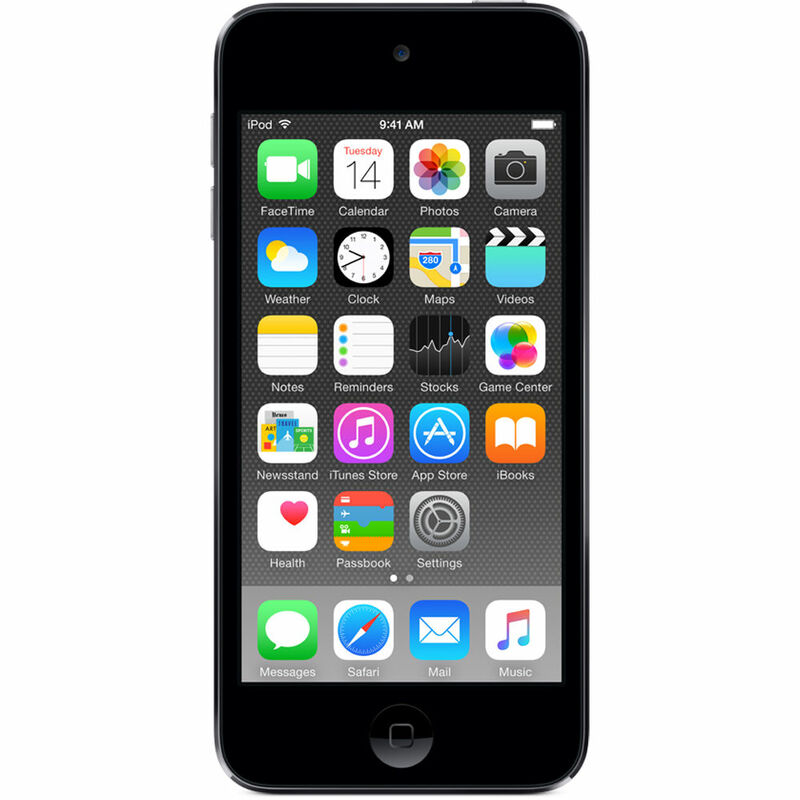 The space gray 32GB iPod touch from Apple has now reached its 6th generation, offering a music player, video camera, pocket computer, and portable gaming device, all in a single, sleek, anodized aluminum finish with up to 40 hours of battery life. The iPod touch offers a powerful A8 processor as well as a Retina display with multi-touch interface. The iPod touch has front and rear cameras for taking photos and videos, as well as having live video chats over Wi-Fi with FaceTime. The M8 motion-sensing coprocessor makes for an improved gaming experience, which can be combined with the Game Center feature of iOS to play against your friends. The touch also connects to the App Store and iTunes, offers multitasking, allows you to connect to the Internet, check email, and much more. The Apple-designed A8 processor is built on 64-bit architecture and features GPU performance up to 10 times faster than the previous generation. The CPU performs up to six times faster than the previous-generation iPod touch. The M8 motion coprocessor continually measures physical motion from advanced sensors, including a gyroscope and accelerometer. This frees up valuable processing resources for the A8 chip. The M8 also provides accurate fitness tracking information, such as steps and distance, directly to the Health app. The Metal API allows developers to design highly immersive console-style games. Metal is optimized to let the CPU and GPU work together to deliver detailed graphics and complex visual effects. This iPod touch features an anodized aluminum unibody design, similar to Apple's MacBook line. It's only 0.24" (6.1mm) thin and weighs just 3.1 ounces (88 grams). Aside from the ultraportable design, the anodized aluminum unibody features a supersmooth finish highlighted by its polished beveled edges. The iPod touch comes in a variety of colors, which have been anodized right into the aluminum body. What you get is a saturated color that still lets the luster of the metal shine through. The 4" multi-touch Retina display has an in-plane switching (IPS) panel that is capable of producing a native resolution of 1136 x 640 at 326 pixels per inch (ppi), an 800:1 contrast ratio, and a 500cd/m² max brightness. The screen also has a fingerprint-resistant oleophobic coating. Apple EarPods have a front vent, a rear vent, a bass vent and a primary acoustic outlet to provide deeper bass and better audio all around while staying stable in your ears. The iPod touch is made from recyclable materials, such as aluminum. Also, every iPod touch is free of toxic materials, such as brominated flame retardants (BFRs) and polyvinyl chloride (PVC). Turn the iPod touch into landscape mode to reveal Cover Flow. In Cover Flow, you can glide through your music by album art with the flick of your finger. Buy and download new music on your iPod touch over 802.11 a/b/g/n/ac Wi-Fi with the iTunes app. If you have your iPod touch linked to your iCloud account, it will automatically push your just purchased songs to all your other Apple devices, such as your iPad, iPhone, Mac, and Windows computer. Bluetooth 4.1 lets you pair your iPod touch to Bluetooth-enabled devices like headphones and speakers. You can also stream music from your iPod touch to AirPlay-enabled speakers over Wi-Fi, to your home entertainment system via Apple TV, or to any speaker connected to an AirPort Express. Crop, rotate, and enhance photos directly from your iPod touch. For more photo and video editing options, iPhoto and iMovie are available in the Apple App Store (sold separately). With Shared Photo Streams in iCloud, you can share your favorite photos with friends and family at a press of a button. You can also post to Facebook or attach it to a tweet right from the Camera app. This iPod touch has Siri, which lets you use your voice to send messages, schedule meetings, place FaceTime calls and more. Throw down a challenge, go head-to-head with your friends, or make new friends (or foes) from all around the world. Check leaderboards for scores and achievements and share your results on Facebook. Send unlimited text messages over Wi-Fi to another iOS or Mac device. It's free and you can even send photos, videos, locations, and contacts. You can even have Siri send a message for you. With over one million apps to choose from, you'll be able to find the app for just about anything. Video chat with friends and family using the front 1.2MP FaceTime HD camera. You can FaceTime with anyone on an iPhone, iPad, iPod touch, or a Mac computer over Wi-Fi. Box Dimensions (LxWxH) 5.35 x 2.85 x 1.15"
32GB iPod touch (6th Generation, Space Gray) is rated 4.6 out of 5 by 114. Rated 3 out of 5 by Blaine P. from A marvelous device, but mine had a problem. In today's world of electronic gadgetry, you couldn't ask for a device with more wonderful features than this pocket sized iPod. It's an engineering marvel. It included every feature that my larger iPad has, yet I could stick it in my pocket and take it anywhere. I could surf the web, check my email, check the weather and stock market, play games, take pictures, listen to Bluetooth music...a computer in my pocket. I loved it! Unfortunately, after about 10 days it died - totally unresponsive. I tried all the suggested fixes, but no luck. I suspect the battery failed. Of course B&H made it easy to return. Very disappointing, but life goes on. Rated 4 out of 5 by Bruce from A great device - but just a good music player I purchased the iPod Touch to replace an iPod Nano. The Nano is a better music player - it's much easier to advance to the next song, pause, or change volumes using the controls on the device while it's in your pocket. The Touch requires you to look at the screen to do the same thing. As a dedicated music player, therefore, it's not quite as handy as the Nano. The Nano doesn't do all the other things the Touch does, so as a useful device, the Touch is absolutely wonderful. It's an iPhone without the SIM card - and it has a (mediocre) speaker as well.?? In summary, I'm happy with the purchase, but miss the dedicated user interface. I like it - I don't love it - as a music player. Rated 4 out of 5 by NZ012 from Still great for Non smart phone users Being retired and no family close by, I don't need full cell phone usage so I have a pay-as-you-go phone and an IPod Touch. When traveling, as long as I have a Wi-Fi connection I can get all my emails, google whatever I need, and be connected the same as an iPhone but without the calls. Just like taking an iPad in miniature with me. Rated 4 out of 5 by John F. from Gold standard Friends have asked- why not just get more storage on your phone for your music? The answer is, I like to have a dedicated music player as an alternative to my iPhone. Saves on battery life for the phone, and gives me a second method of surfing email and internet when I'm within range of wifi. Four stars for a quality mp3 player with lots of other features and capabilities. It's not five stars because what I would REALLY LIKE from Apple is a reasonably sized and reasonably priced iPOD. Like the old classics. A music player. I don't really need 160gb- 32, maybe 64 is perfect. The Nano is not enough, 7th gen is too big. I think Apple has missed the boat on not addressing this need. Rated 4 out of 5 by kharakim from Glad I upgraded from 3d generation The 6th generation iPod Touch is dramatically improved over the 3d generation, which I have been using for several years. Particularly nice is the addition of cameras and the ability to run the latest iOS. Also appreciate the CPU speed, the quality of construction, and the Lightning connector. My only slight disappointment is that the battery life is somewhat less than I expected. Rated 5 out of 5 by Darius C. from Much needed upgrade I had an old iPod that did not have enough space to store over 1000 songs. This was the best much needed upgrade in a long time. Works well with the Amazon Alexa echo dot for wireless music listening experience and plenty of space for future songs that I would like to add. It's also great if you have Mac because all of your iTunes songs will synced up with it too. The battery is very impressive. I do not have to charge it often like some of my other devices that I have. It's small and very lightweight too. Thank you B and H for making this upgrade fast quick and easy with one stop shopping. Rated 5 out of 5 by Emily from Great device. Works well. This is what our kids have, no phones yet for them, but works just like the iPhone minus the bill for phone service!! Kids even have an app that gives them a number to use like a phone if needed. The Uber app for iOS devices requires iOS 9 or higher. The iPod ships with iOS 8. Just update the iPod (it will prompt you during set-up) to the current version which is iOS 11.2.6 and you will be good to go. Does it have a built in equalizer? Yes, it does have built in EQ settings. good night, the iphone can be used in Venezuela, is released? B&amp;H will not be offering the iPhone. Apple has not made any official statements regarding discontinuing this device in the near future. My daughters's Ipod touch will not hold a charge. We purchased it in December, 2017. What can we do to fix it? This is an iPod and may be used in Venezuela. B&amp;H does not offer any iPhones for sale. Does it come with a warranty even if you do not choose Apple Care? ( It does on the Apple website ). This product has a one year, limited warranty.